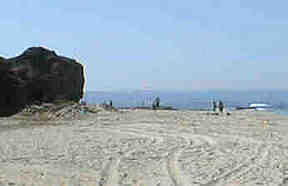 From Broadway, turn left heading east on PCH, Aliso Beach is right off of PCH in the South Laguna Beach area. 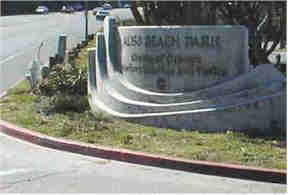 As you are driving on PCH look for the large parking lot and the brick fence (pictured above) indicating Aliso Beach. This area is rather easy to find due to the size and popularity of this beach. There is also a rather distinctive pungent odor on the highway right at this area (sewer plant?). 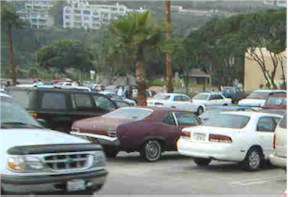 There is lots of parking at Aliso Beach but due to the popularity of this area you may have difficulty finding a place to park on crowded days. Parking is NOT FREE they have this strange parking system where you buy a ticket from a machine that has an expiration time stamped on it. Do not let your parking permit expire, you will get a ticket (Laguna Beach Parking officers are the fastest you have ever seen, and there are no exceptions). Parking is 1 dollar per hour. 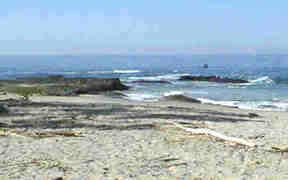 Beach Access at Aliso consists of walking across the sand to where you want to enter the water. This is a very popular public area, watch for other swimmers and surfers here. Straight out from the parking lot is NOT a particularly neat place to dive. The further you walk to either side at Aliso the better the diving is. 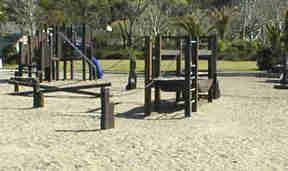 Facilities at Aliso Beach are a kids playground (pictured), tables, fire pits, showers, bathrooms and telephones. There is also a temporary lifeguard trailer stationed at Aliso Beach. This is a nice place to have a picnic lunch or dinner after a day of diving and it has an appeal for the non diver in the family as well. On the far side (east) of the beach I have also seen people (typically male) sunbathing who were rather scantily clad (you have been warned). Diving at Aliso Beach is very good on the reef to the east (pictured) where there are many small rock crevices to explore with your flashlight. This beach is very exposed to the surf and it's best to enjoy Aliso on a very calm day, you won't have to fight the surfers either. The beach on the West side has some really great diving also. About 100 yards out from the beach and running lengthwise there is a reef that runs along the beach. This reef has many areas where the rocks have formed an overhang and there are lots of large holes where there are large lobster. The holes are not big enough for the diver, but are great to explore with your flashlight.